Confession: we here at Lefort have gone from one to 100 in Weyes Blood appreciation in the last 48 hours. 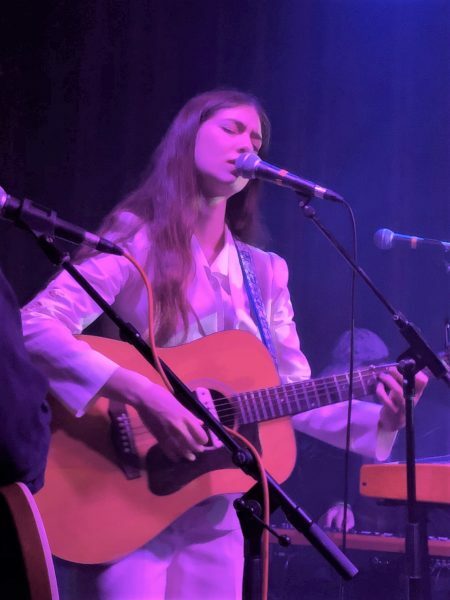 While previously only catching snippets of songs and inklings of the oeuvre of Natalie Mering (dba “Weyes Blood“), we have suddenly grown wise to the artistry in Ms. Mering’s music. Much better late than never. At the onset of their big upcoming tour in support, Weyes Blood today is releasing its justly-lauded new album Titanic Rising, and we have been listening to it intently since finally cracking the code. The album is a must-hear, rife with complex, string-laden pop melodies and lush production (think “dreamy” ’60s-’70s productions) that manage to deftly tug at your heartstrings. Throughout, Mering rollercoasters lyrically from low heartbreak to high hopes and back again (file under “life”). If you aren’t already, get wise to Weyes Blood today via the new album at all the usual sources. You can pick up the preferred vinyl HERE. As luck would have it, Ms. Mering came to Santa Barbara Wednesday night and, decked in a bright white pantsuit, held sway at Velvet Jones with a mesmerizing set comprised mostly of songs off Titanic Rising, but also including a couple of older gems and a great cover of the Beach Boys’ God Only Knows. While they couldn’t possibly match the orchestral majesty of the new album, Mering was backed by a fab foursome of phenomenal musicians/vocalists (apologies for the namelessness) who managed (with Mering) to recreate both the sheen and drive, but also the nuances, of Titanic Rising. An early highlight was the ebullient Everyday (off the new album) with its sunny Mamas & Papas inflections straight outta Canyon (Laurel). Andromeda also swept up the crowd with its Patsy Cline-as-interpreted-by-Aimee-Mann leanings. The emotional Seven Words (from 2016’s Front Row Seat to Earth) followed, packing its devastating punch, before ceding to additional melodic masterworks from Titanic Rising. 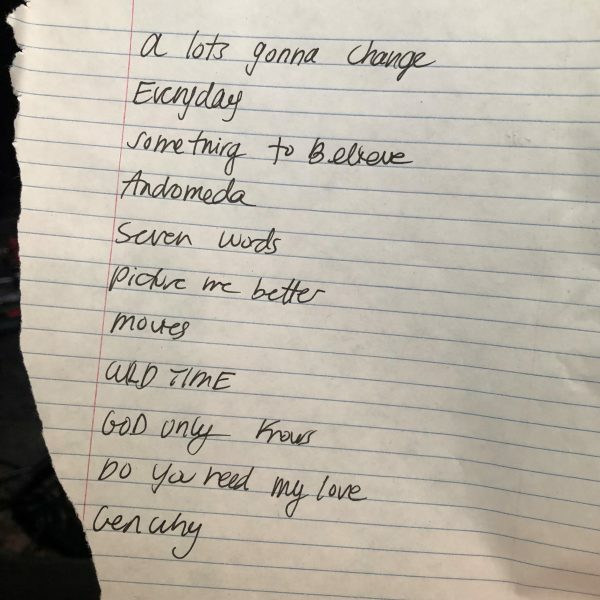 As you can see from Mering’s handwritten setlist below, they closed out the set (or so we and she thought) with the serene, expectant “anthem” Generation Why (YOLO why?) to the crowd’s delight. So delighted was the crowd that they would not relent and Mering reappeared with acoustic guitar to perform solo her beautiful ballad Bad Magic. You could hear a pin-drop in the venue until she finished her evocative song and the crowd erupted again in appreciation. 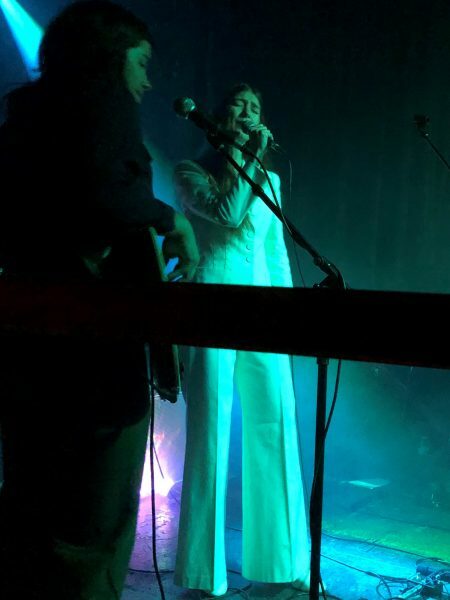 Don’t miss Weyes Blood the next time they come to a town near you. You can check out the other dates of their tour and buy tickets HERE.